The genesis of Maples Fund Services lies in the leading global law firm Maples and Calder, which over its 50-year history has become the world’s largest offshore firm by headcount. The legal practice is a major service provider to the investment funds industry, and has relationships with 38% of all hedge funds formed in the Cayman Islands. In1997, Maples and Calder launched MaplesFS (formerly known as Maples Finance) to provide fiduciary and accounting services to special purpose vehicles used in structured finance transactions. In 2003, its investment funds division was established, initially focusing on the provision of fiduciary services. In 2005, MaplesFS expanded the investment funds division to provide a complete range of fund administration services to its clients. Today, MaplesFS consists of two operating divisions. Maples Fiduciary Services is a key player in the provision of independent governance services to investment funds and structured finance vehicles. Maples Fund Services (MFS) provides a range of outsourcing services to fund vehicles and their managers including fund accounting, investor services, middle-office operations, analytical reporting and other solutions that can add up to a “one stop shop” for many clients. 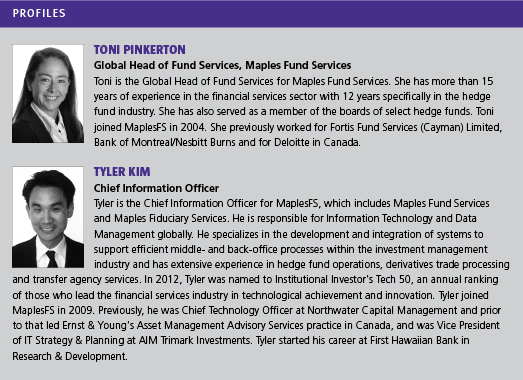 Tyler Kim, chief information officer of MaplesFS, recalls that four years ago a strategic decision was made to establish technology as a source of competitive differentiation for Maples Fund Services. “We invested in a new technology platform that enabled us to implement a truly global operating model for our fund administration business,” he says. In 2009, the Montreal office was established that introduced a team of technology professionals and data management specialists that were at the core of executing MFS’s new strategy. Within a couple of years, the firm had harmonized and streamlined business processes across its offices in the Cayman Islands, Montreal, Hong Kong, Dubai, Luxembourg and Dublin. This global operating model results in robust routines for striking net asset values. The process starts with the utilization of straight-thought processing systems for trade capture and continues into automated reconciliations amongst manager, prime broker and administrator records. Price data and corporate actions are then retrieved from independent market data vendors – including Bloomberg, Markit, and IDC – that allow Maples’ systems to update and value investment positions. Kim is the first to admit that inputs are not always perfect, so some human intervention is still needed to review data and identify when things don’t look quite right, but even here technology can greatly smooth and speed the process. A dedicated data management team works closely with their IT counterparts to maximize the value that technology can provide to process optimisation and precision. Maples’ technology platform also offers flexibility; it can easily cope with complex structures, which include master/feeder funds, multiple share classes, multiple currencies, and many series where performance fee calculations may be slightly different in each case. NAV strikes are only the start of the spectrum of outsourced services that Maples is now able to offer. MFS has worked out that it can leverage the infrastructure and capability established for its fund administration business into other services. Their launch of middle-office outsourcing in 2010 was the first step outside of traditional fund administration. With this offering, MFS’s value proposition expanded past the fund vehicles that managers establish for investors, into the provision of services that directly enhance the operations of managers themselves. Fund managers are awarding mandates to MFS for providing portfolio accounting services across their entire asset base, beyond just the accounting within their commingled funds. In addition, this offering has allowed MFS to tap into new types of clients. For example, many institutional investors are trending towards a more ‘do-it-yourself’ model, and require the kind of systems and operational infrastructure provided by MFS to do so. The next extension of Maples’ repertoire came in 2011 when their risk reporting offering was formalised, using the capabilities that MFS developed as part of its middle-office services. Maples has an extensive library of risk templates, and calculates standardised metrics such as Value at Risk, correlations, factor risk, and sensitivity analyses. Other risk measures can be customized to client requests. Kim feels pleased that MFS has proven its ability to win client mandates against large, well established risk system vendors. He argues that other risk software offerings often provide people with far more features than they use, as today’s audiences for risk reports are much broader than just portfolio managers. Moreover, drawing from their extensive experience in data management for fund administration, MFS has recognized the importance of ensuring that data going into their systems for analysis is accurate, even though it may not always arrive this way. Their data management team is involved in extensive quality reviews and engages in discussions with custodians, brokers, administrators and managers to ensure the integrity of inputs to their risk system. MFS applies the same scrutiny to their data outputs. In addition to client-oriented deliverables such as board reports, their systems are also called upon to provide extracts that comply with third-party reporting standards, such as OPERA (Open Source Enabling Risk Aggregation) and Albourne. MFS emphasizes the importance of information being intuitive and digestible. To ensure this, the MFS approach to risk reporting has the same philosophy as other parts of the business: customise the solution to client preferences. MFS has worked with clients to build bespoke dashboards of risk measures, which, Kim says, “resonate more with their actual needs than boilerplate solutions.” San Bernardino County Employees’ Retirement Association (SBCERA) chief investment officer Don Pierce, interviewed in Asset International Chief Investment Officer, is delighted with the suite of reports that MFS created for him. The reports cover asset allocation, performance reporting and risk reporting that need to be shown to the pension fund board on a monthly basis. In particular Pierce praised the ability of MFS to condense the data into a presentable format that can be digested in half an hour. As a next step, MFS is applying what it has learned from the delivery of sophisticated risk reporting mandates for large clients to the development of ‘productised’ technology solutions that can meet the needs of smaller managers. On-line dashboards built by MFS, branded MaplesFS Connect, were launched last year to provide clients of their hedge fund administration business with a comprehensive view of positions, allocations, profit and loss, performance and risk for funds administrated by MFS. In addition to the standard offering, ad hoc tailored dashboards can be developed by MFS to reflect clients’ unique needs. MFS is proud of its ability to apply its structuring expertise in the customisation of solutions to meet clients’ specific needs. MFS is open to reverse enquiry suggestions for creating all kinds of operational structures for the most specialised or the most diverse mandates. For instance, MFS administers an offshore multi-manager CTA platform that utilises a US mutual fund front end for gathering retail assets. In another example, MFS advised a fund of funds specialising in credit opportunities on how it could migrate to a more transparent fund of managed accounts model. The best demonstration of the versatility of MFS’ capabilities is a bespoke managed accounts programme built for an institutional investor with assets managed by a large number of differenthedge fund managers employing multiple strategies. The Incubator platform, designed to host smaller managers, draws on all of the lessons Maples has learned from outsourcing, productisation, and finding gaps in the market. This plug and play solution provides bundled services for start-up funds, and offers a platform from which they can establish a verified track record to help raise assets. The platform has 12 managers so far. In this area, MFS garnered HFM Week’s 2012 award for Best Administrator of Small and Start-Up Funds. Funds of all shapes and sizes can make use of Maples’s fund launch services, which include help with reviewing documents, including over the counter (OTC) counterparty agreements, and on-boarding with brokers, custodians and counterparties. “The technology strategy is two-pronged,” says Kim, who believes in first choosing the right vendors to partner with – and actively working with them to improve their own offerings. At the core of MFS’ systems is another UCITS Hedge Award winner – Advent’s Geneva. Kim has spoken at three of the last four Advent conferences and collaborated on two white papers as part of a thought leadership partnership. Advent’s Geneva is sophisticated enough to deal with the multiple currencies, high trading volumes, and more complex instruments that can be entailed in MFS’ hedge fund clients. Another big partner is Linedata, which provides MFS’ transfer agency system, Mshare. This system is used to maintain a wide array of investor registers and related transactions for hedge funds, private equity funds and managed accounts. In 2010, MFS worked with Linedata to build a web front end to MShare – Linedata Reporting – that can be used by managers and investors to view information about their holdings, transactions and other documents through an online portal. These external solutions are complemented by an in-house team of capital markets and technology experts, who focus on building out proprietary solutions that can’t be bought. Software developers have built systems that range from online dashboards, document libraries and workflow management to straight-through-processing mechanisms and speciality tools that produce private equity waterfall calculations. Business systems analysts with strong industry expertise are the key to designing these solutions in a way that meets client needs and resonates with the market. They are often called upon to work as consultants, dropping on-site to work directly with clients on the process re-engineering and system requirements definition required to deliver MFS’ high-value, bespoke solutions. Industry standard software, including Microsoft SQL server, IIS web server, and other web components from vendors like Telerik underpin MFS’ software architecture. Embracing progressive development trends such as HTML5 allows MFS to keep its solutions current, and ensure compatibility with new norms, such as mobile devices. From an infrastructure perspective, in 2012 MFS completely virtualised their environment using leading-edge solutions from VMWare, Tintri, Nimble and Brocade to ensure that there is a scalable, high-performance backbone for all of their hosted solutions. Maples’s success at harnessing technology has been recognised with a spot on Institutional Investor’s Tech 50 List, which recognizes executives and companies that lead the financial services industry in technological achievement and innovation. If staff turnover is the bane of every professional services firm’s life, then MFS is a relative oasis of calm. A rich pool of finance and engineering graduates from universities such as McGill, HEC Montréal, and Polytechnique Montréal means there is more talent than job opportunities in their local market. Recruiting and retaining the highest calibre professionals is a top priority for Kim. Montreal’s IFC (International Financial Centre) programme – on which Kim serves as an advisory board member – helps to make the city an attractive place for MFS to do business. The years of investment into technology have provided a solid foundation for global growth and future geographic expansion. MFS is always re-assessing its jurisdictional footprint, and is attracted to markets that have immediate potential to be profitable. Singapore is one example where the expanding private wealth management space looks especially interesting as a new market, as MFS explores ways in which the technology offering it developed for pension funds and hedge funds can be extended to meet the needs of private banks and family offices. Those early beginnings in the Cayman Islands sowed the seeds for what is becoming one of the most versatile, technology-savvy and customer-focused hedge fund service providers in the offshore and onshore worlds.